She was dressed in a flowing gown of white, but there was nothing chaste about her; chained, her hands, to links of gold, she is the devil’s own, his saboteur. 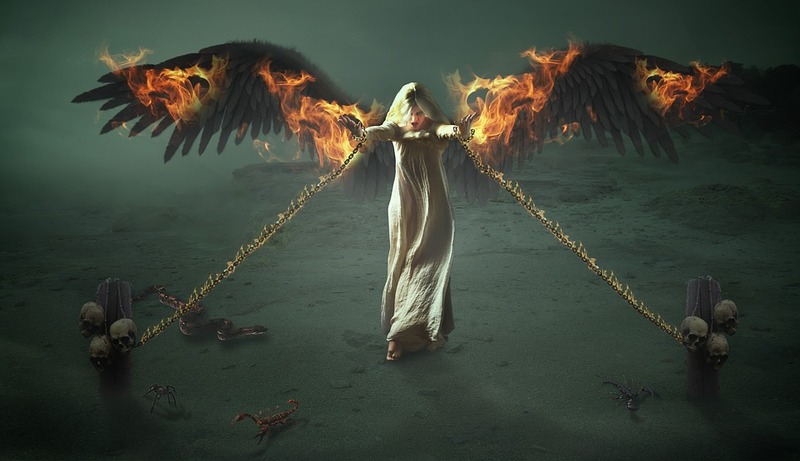 Fires blazed from her wings, as demons came to seek; the ones who dared to get too close, are made weaklings, ever meek. Her bindings, wrapped around a pole, each with a trio of skulls; snakes and scorpions at her feet, she’d been rejected, a mere cull. She would not settle for second best, she vowed to prove them wrong; unleashing her quite evil wrest, defeated those, so strong. For the skulls that clung so near her, fastened to the wooden pole; are the heads of those who cast her out, twas where she drowned them, in the shoal. So if at night, you hear a sound, a terrifying clink; take shelter far away from here, she’s found release, from the edge of the link.